I’d wondered about this curious sandstone block, embedded in one of the gate posts of the Garden of Remembrance on Bird St, but it wasn’t until I read a newspaper article on the unveiling and dedication of the war memorial that I learnt that it is apparently an ‘ancient’ boundary stone. The article in the Lichfield Mercury, dated October 22nd 1920, describes how a high wall running along Bird St was demolished and replaced by the stone balustrade that now runs along the edge of the garden. Prior to its demolition, the boundary stone was originally incorporated into this wall, but whether that was its original location, or was an earlier effort to preserve the stone, I don’t yet know. It seems to be marked and I’m wondering whether this is deliberate or not (or if I’m imagining it!). Also, just how ancient is ancient? A newspaper report from May 1936 describes how the Cathedral Choristers observed the tradition of ‘Beating the Bounds’ each Ascension Day. 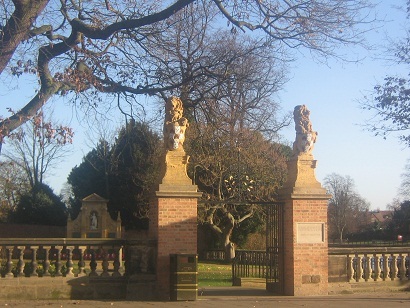 Accompanied by members of the clergy, the boys would start opposite St Mary’s Vicarage and stop off at places were there was, or had been, a well – ‘midway between the pool and Gaia Lane’, the Bishop’s kitchen garden, the Dean’s kitchen garden, Milley’s Hospital, the boundary stone on the Minster Pool Bridge and the Verger’s house in the corner of the Close before finally gathering at the old pump to the North West of the Cathedral, to which water from the Conduit Heads up near Maple Hayes once flowed along a lead pipe. The boys would carry elm boughs, and at each of the stop off points there was a reading from the scriptures and a verse of a hymn was sung. In 1936, the elm boughs were brought inside the Cathedral and laid on the font. An account from 1910 describes how choristers would collect boughs from the Dimbles and then return to the Close where they would decorate the houses before commencing their perambulation. I understand that these days Ascension Day is marked by the choristers singing from the roof. It’s interesting that elm boughs used to play a part in the custom; it makes me think of old traditions related to the Lichfield Bower which takes place in the same month. ‘Beating the bounds’ apparently dates back to a time before maps and was a way of ensuring that the knowledge of where the boundaries of an area, or a parish, lay was passed on. The tradition in The Close seems to have been centred around wells and water, but in other places boundaries were also marked by other natural features. A Gospel Tree is marked on OS maps of Gentleshaw up until the 1930s and Gospel Oak is a common place name, found all over the country. On the subject of maps, there’s a great version of John Snape’s 1781 map on BrownhillsBob’s Brownhills Blog here. I think that the boundary of the Close, similar to that described above, is shown clearly on this map in the form of a dotted line running around the Close. There’s a lot more to be said on boundaries and their markers, including the exciting possibility (for me at least!) that if this one is still here, there just might be others preserved somewhere in or around the city. In fact, we may even have located a couple, purpose as yet unknown. Edit: Just had one thought myself actually! In many places it seems boundary stones and trees were actually hit with sticks (as can be seen here in Oxford) or physically marked in some other way, as people passed by them on their perambulation. 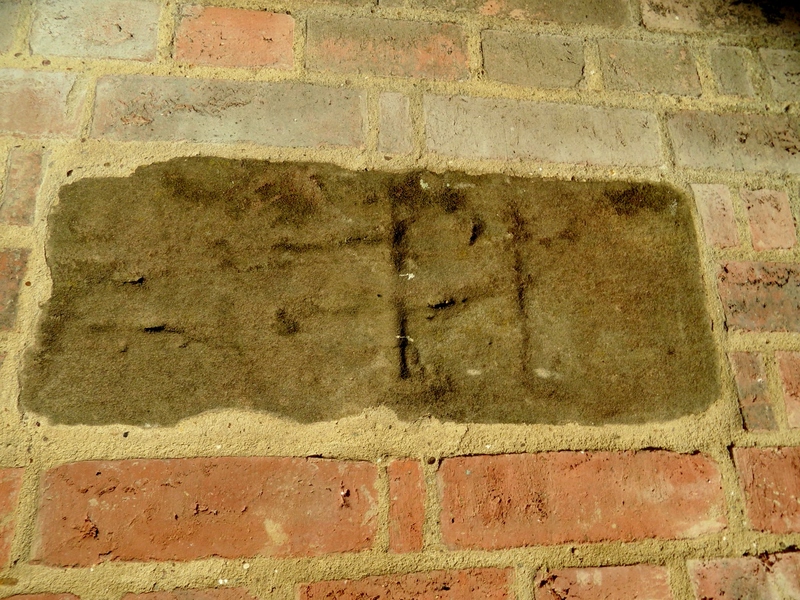 Is it possible the marks on our boundary stone are evidence of it being ‘beaten’ over the centuries?